I love ribs. 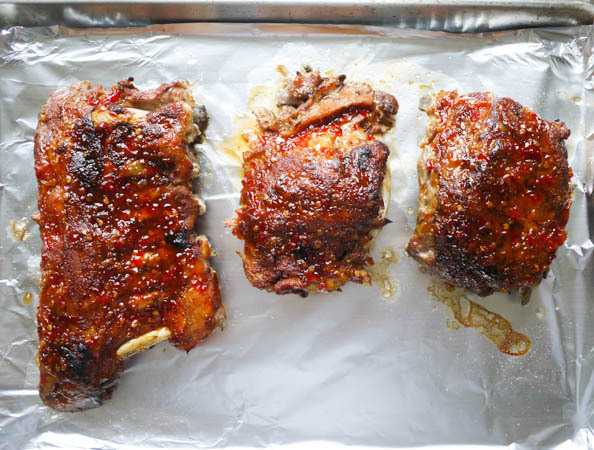 Up until I ran across Steamy Kitchen’s Thai Sweet Chili Ribs recipe, I had only ever had them slathered in BBQ sauce. Jaden’s recipe is an amazing twist! 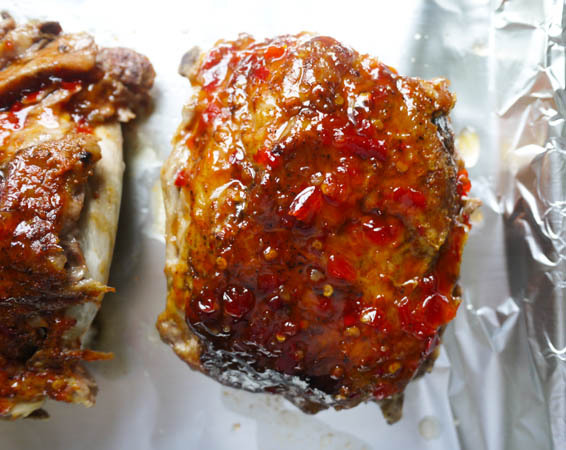 I’ve adapted her recipe by adding sriracha and bbq rub to take the flavor up a few notches and also modified it to be made primarily in a crockpot and then quickly broiled in the oven. Get out your slab of baby back ribs. 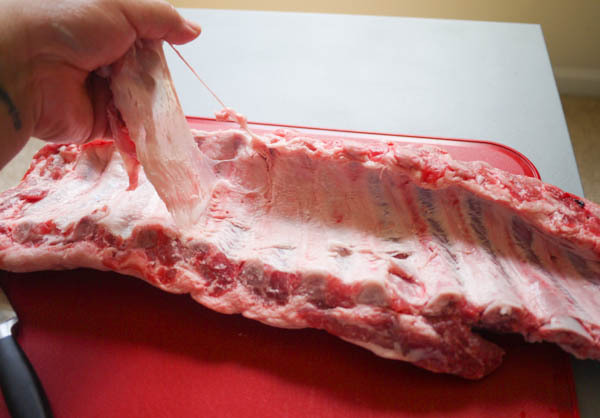 Flip it over so you have access to the membrane, a thin film that covers the meat and bones on the back. 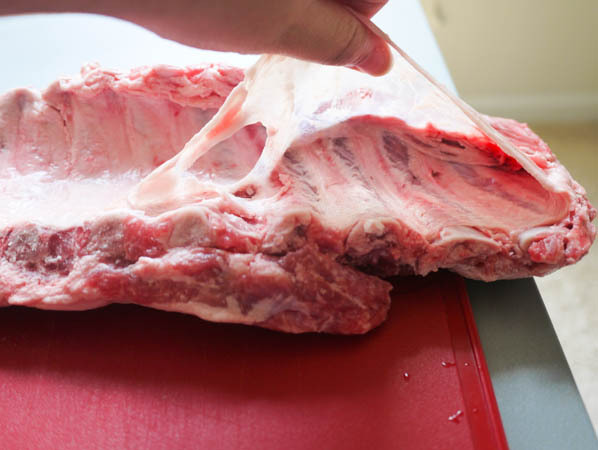 Using a knife, start to pry away the membrane from the bones. Once it is lifted, you can use your hands to easily tear the rest of it away from the bones. Rub both of them all over the surface of the ribs. They will combine to make a nice seasoned paste. 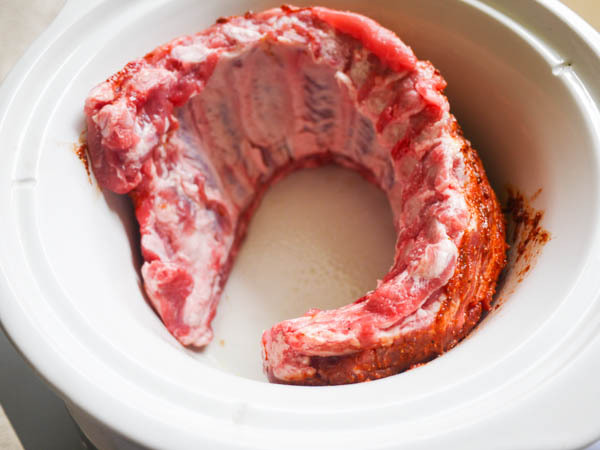 Grease a crockpot and set the ribs inside of it standing up against the sides. 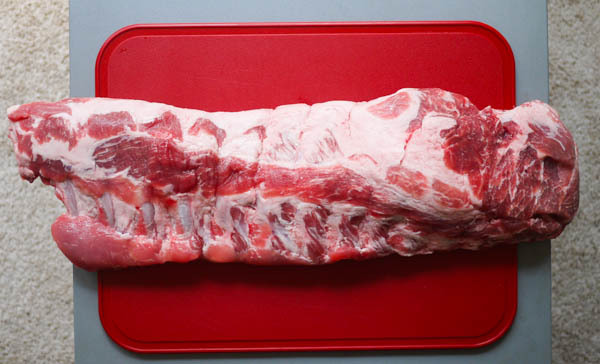 This will help the ribs to get a nice crust. 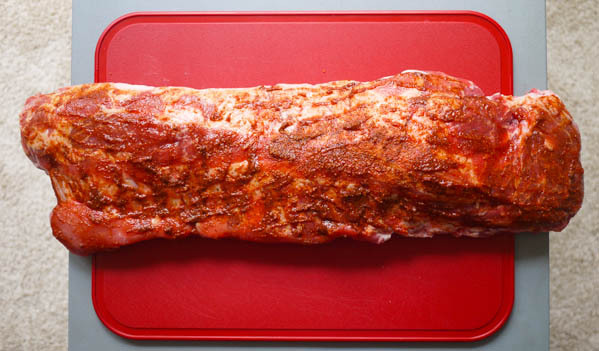 Using a pair of tongs, carefully remove the ribs from the crockpot and place them onto a foil-lined baking sheet. 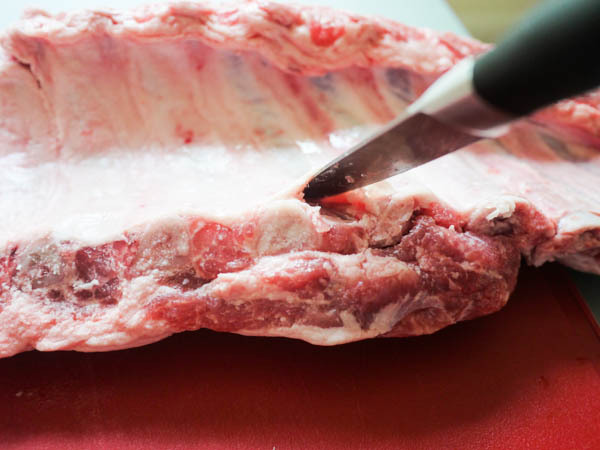 The meat will be fall-off-the-bone tender, so it’s not likely you’ll be able to pull out the slab in one piece! 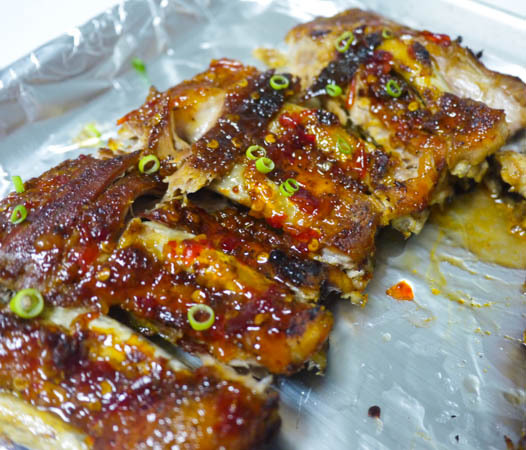 Spoon the thai sweet chili sauce over the ribs and make sure the entire surface is well-coated. If you don’t want to use an extra appliance, you can stop right here and eat them. But they will not be as good as finishing them off with the next step! It only takes a few minutes and really puts the dish right over the top! 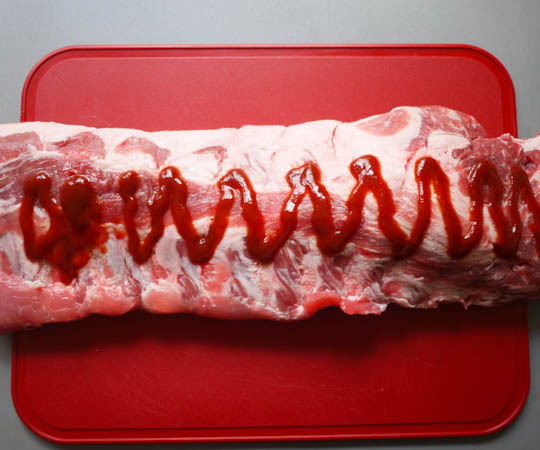 Set your oven to broil and place the ribs in the oven for approximately 3-5 minutes, until the sauce starts to bubble and turns thick. Using a large knife, slice into individual servings. 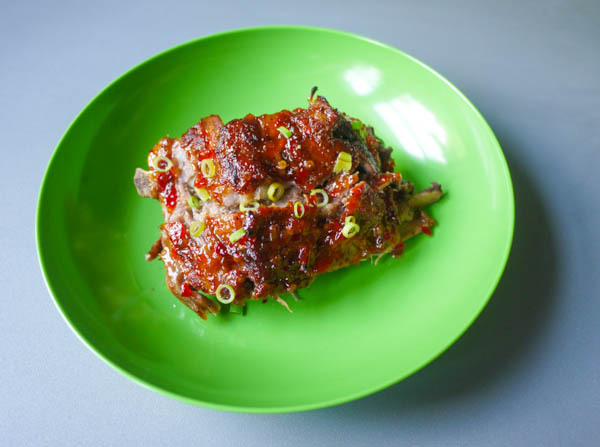 Spicy, fall-off-the-bone ribs cooked in the crockpot and finished under the broiler with a sticky thai sweet chili glaze. 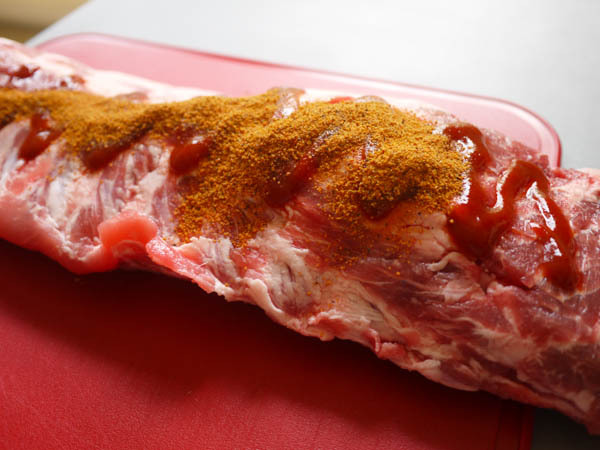 Flip the slab over and season it with sriracha and bbq rub. 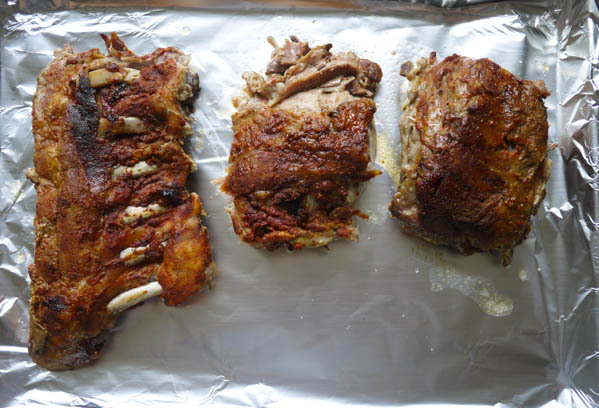 Using a pair of tongs, carefully remove the ribs from the crockpot and place them onto a foil-lined baking sheet. 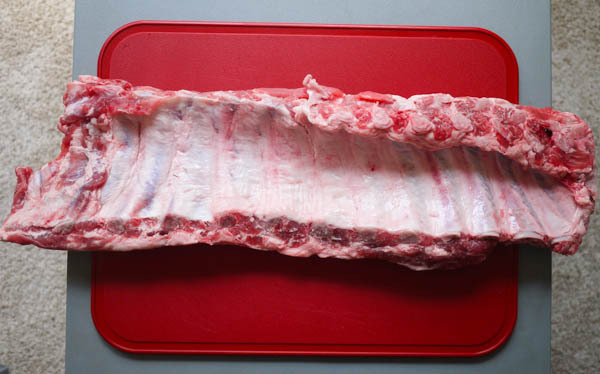 The meat will be fall-off-the-bone tender, so it's not likely you'll be able to pull out the slab in one piece! 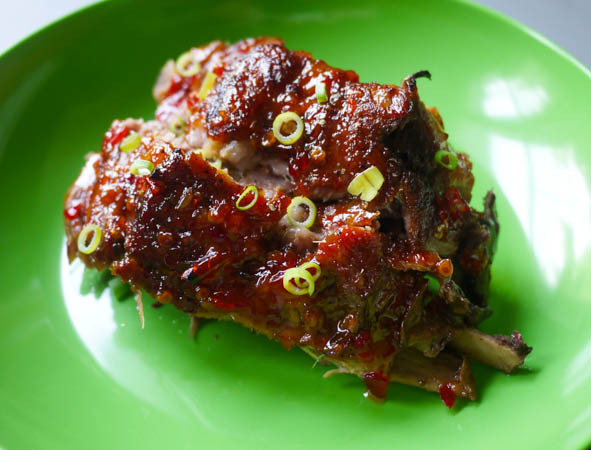 Spoon the thai sweet chili sauce over the ribs and make sure the entire surface is well-coated. If you don't want to use an extra appliance, you can stop right here and eat them. But they will not be as good as finishing them off with the next step! It only takes a few minutes and really puts the dish right over the top! Oh yum!!!!! 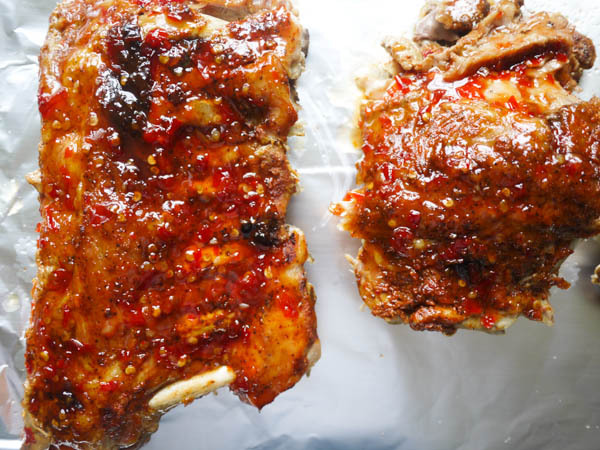 There was a great recipe for these thai flavored ribs that, while the first time they came out great, the few times after I made them just didn’t live up to my expectations and I’ve been dying to have another recipe to try. These look so delicious, I am definitely going to have to give these a try!! 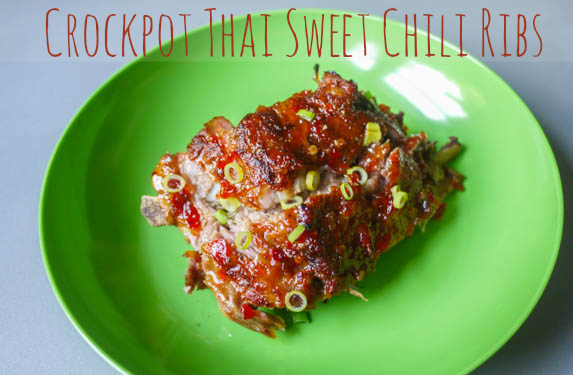 And I love that you can stick them in your crockpot – that makes them even better!